A lively university town in a beautiful mountain valley. Grenoble is one of the major cities in the French Alps, located in a valley at the confluence of the Isère Drac rivers, and surrounded by beautiful mountains (map). 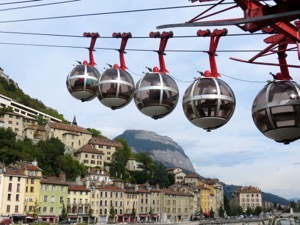 You can get the best views and a sense of the town by riding the "bubbles," a unique cable car that crosses the Isère River and takes you to the Bastille. This fortress was built between 1823 and 1848, though the strategic site was important for centuries. Today you can explore the Bastille on foot, with trails, footbridges, and paths to the dungeons. The site also hosts a variety of expositions, concerts, and festivals; check locally to see what's on. And climbing installations (called "acrobastille") offer plenty of activity for children. The Bastille is also home to the Memorial to the Mountain Troupes, reachable on foot (about a 30 minute walk). If you're feeling ambitious, you can also walk up to the Bastille and save the cost of the bubbles. But the bubbles are fun and offer unique views. Back in the city, note the colorful buildings that line the banks of the Isère, and walk across the Saint-Laurent footbridge to get the full view. The right bank is called the Saint-Laurent district. The old part town (on the left bank) is quite compact and can be explored on foot. Major sites include the Place Grenette (also home to many restaurants), the Grande Rue, the Place St-André, with the Ancien Palais du Parlement du Dauphiné, or former parliamentary palace for the region then known as the Dauphiné. Grenoble has several excellent museums; note that most are closed on Tuesdays. The Musée de Grenoble (Grenoble Museum), housed in a late 20th century building, has an impressive permanent collection. The Musée de l'Ancien Évêché, located in the former Bishops' Palace, focuses on the region. The Musée Dauphinois, across the river and below the Bastille, explores regional art and traditional society. This being a French town, you might also want to visit the markets. The Halles Ste-Claire are in a relatively small building in the old town (near the Tourist Information Office). Nearby the aptly-named Place aux Herbes hosts an open air market every day except for Monday. And of course there are interesting churches, including the Cathédrale Notre-Dame and the Collégiale St-André (in the Place of the same name), which dates from the 13th century and was formerly the burying place of the dauphins. 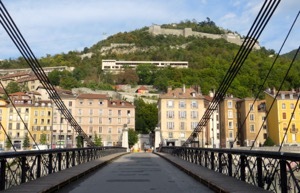 The Tourist Information Office offers a Grenoble Pass that can help reduce costs if you're doing several activities. Above, Looking across the Saint-Laurent footbridge to the Bastille. Below, The "Bubbles" head up to the Bastille from the banks of the Isère.